As someone with dry skin, face powders are not an essential but they sure can complete a look and tie everything together. 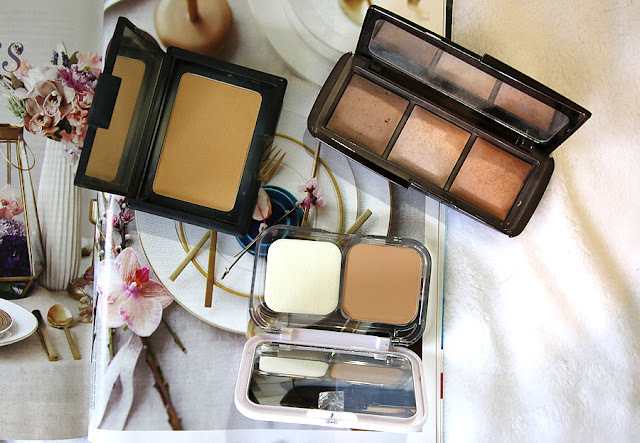 So in this post I am walking you through three powders I love for my dry skin that I feel set my face makeup but also work with my dry skin to look great. Starting out with the NARS Pressed Powder and the reason it works so great on dry skin is because of it's buttery formulation that hydrates and locks in moisture. It takes away the shiny finish of foundation and leaves you with a velvety finish on the skin. It is butter smooth and silky to apply so doesn't leave your skin dry or enhance any dry spots that you may have. The main thing I love about this product is that it makes my skin look incredible soft and smooth while leaving a light and natural look to my skin. The powder is so finely milled that instead of sitting on the surface of your skin, it blends into your foundation while still managing to set it. Pretty amazing right?! This product retails for $50 and is available from Mecca. You can read my full review of this product here. Next we have the Hourglass Ambient Lighting Palette which is a fantastic option for those with dry skin because the lighting properties of these powders add dimension to the face. This shine does not look oily at all but rather brings the face to life and leaves a beautiful radiant finish, detracting from oily skin. I also love how you can mix and match the three colours to shade and highlight. This product retails for $87 and is available from Mecca. You can read my full review of this product here. Lastly we have the new and shiny Maybelline SuperStay Better Skin foundation which is an interesting one if you have any acne. It actually contains 2% salicylic acid to fight breakouts. This is such a fantastic idea for temperamental skin that dislikes being covered up in powder because it gets treated at the same time. I find this to have a very creamy and light consistency which works well with my dry skin but if you struggle with extremely dry skin you may want to be careful as salicylic acid can sometimes by drying. This product retails for $21.95 and is available from Priceline here. Those are my top three pressed foundation picks for those of you with dry skin. These are great if you want to get rid of the shine from your foundation but can't handle anything too powdery or drying.